Home › Kram's Korner - From the Club Level › Au-Mont? Awwww-Yeah! Phillippe Aumont returns to the starter role for the first time since 2010 tomorrow as scheduled starter Severino Gonzalez has been tabbed to start for the Phillies on Tuesday in St Louis. I know the IronPigs are in the basement. No, actually, if there’s a level below the basement–kind of a crawl space if you will–that’s where the ‘Pigs currently reside. You can complain about the losing (DiPro…) but you can’t complain that you’re bored. It moves fast around here, so let me give you a couple quick things about tonight. Chad Billingsley is still not worried about the results. Seriously. That’s what he said after the game. Yeah, I noticed too. The SteelHawks had a 46-13 lead on Trenton, and still only won by 3–on the last play of the game. Crazy. Never take your foot off the gas in those games, I say. Just hand it to Marshawn Lynch, I say. Nobody listens. Severino Gonzalez will start for the Phillies on Tuesday in St Louis. I bid on his jersey tonight! But, alas, I didn’t win. But wait, isn’t he supposed to start for us tomorrow? Jimenez? Nope, he pitched yesterday. Plus, he’s been horrible of late. Nope. He’s already in the rotation. Bull-pen day, probably. Perhaps Loewen can go three. I’m sorry. I couldn’t hear you over all the losing. That’s right. 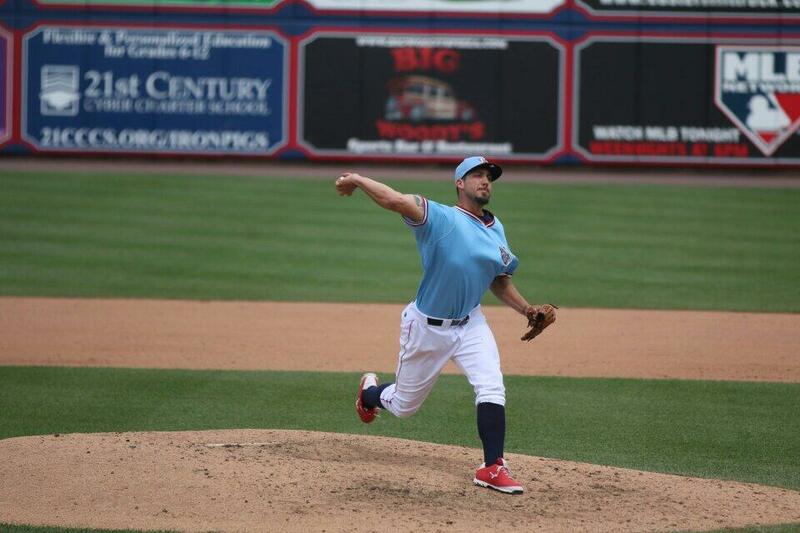 Phillippe Aumont starts for the first time in five years. Aumont has a no-hitter through six. Brundage is torn. What will he do? Aumont is going for the pitcher cycle: 4 wild pitches, 3 hit by pitch, 2 passed balls, and a balk. It could happen. Fans revolt and throw fleece blankets on the field. Seriously, prices are going up and we want to see wins. Remember the guy who threw Brundy out of the game last night because he couldn’t get the calls right at second base? Yeah, he’ll be behind the plate calling the balls and strikes tomorrow. Multiple players and coaches could get ejected. There’s a post-game tailgate. All ejected players have an automatic invite to the post-game tailgate. We could get some good stories up in here! I might wear a hockey jersey just to support Phillippe! The return of the ROAST-BEEF — COLD BEER chant. 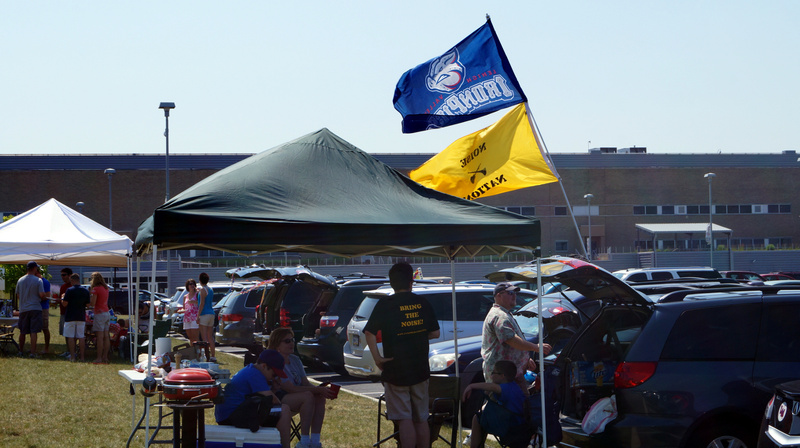 We’ll be tailgating pre- and post-game. Look for the flags. “Joe’s corner” is the far point of the “Cherry Coke” lot just across IronPigs Way from the “Cherry Coke” preferred lot. Pre-game we’ll be enjoying subs from Wegman’s and for post-game I’ve prepared some nice hot dog chili. Diet sodas and Yoo Hoo’s will be available. Let me know if you’ll be stopping by. Never bored – for sure. Win, lose (by one), or go to the shootout – FLEEEEP! I’ll be there 9 am…. Hot peppers on the short Italian – please. And if the pitching cycle happens? The IronPigs shoud sign Phantoms thug Jay Rosehill and put him in uniform for today’s game … in case the Buffalo Bisons get up by ten runs again, of course.